With less than a month to go till The Merthyr Rising, the latest edition of the Branch Newsletter, Y Faner Goch, is a special twelve page Festival edition. 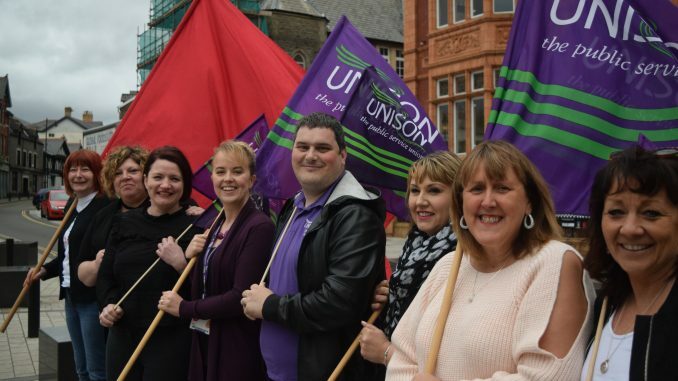 The newsletter is a joint venture between Cwm Taf Local Government, Cwm Taf Health and University of South Wales branches of UNISON, the union for public service groovers. The three branches have come together this year to be joint lead sponsor of the festival. Mixing UNISON news and info on the festival, this edition is part newsletter, part zine, part programme. You will find details of the line-up for the festival, articles on mixing music and politics and an interview with Larry Love of the Alabama Three, alongside an introduction to the three UNISON branches. The newsletter will be distributed in hard copy around members in the next few weeks and there will be copies available on the UNISON stall at Merthyr Rising. If you can’t wait till then, you can download it by clicking here.